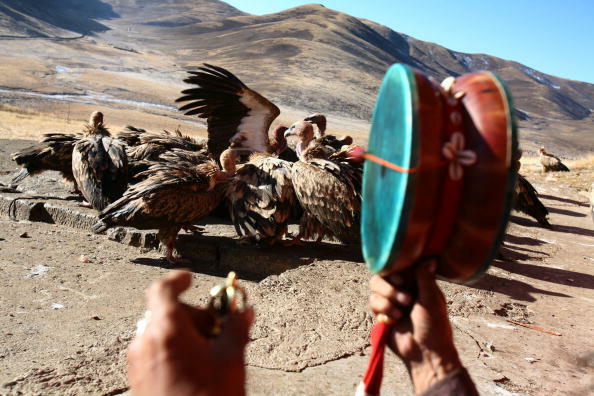 What is a Sky Burial? Western funeral traditions vary by region, religion and values, but most involve protection of the body. Catholic funerals often involve embalming processes in order for a final viewing of the body in an open casket, prior to burial. Jewish beliefs dictate that a body should be kept whole, washed and handled with great respect before being buried in a simple wooden casket. However, in many parts of the world, corpses are not handled with this level of physical protection. One fascinating example of this is in the ancient eastern tradition of sky burials. Mongolian sky burials, also prominent in Tibet (and referred to as Tibetan sky-burial), are guided by Buddhist principles. Believing that a body is devoid of the soul once a person has passed away, there is no need to preserve their body after death at all. In a sky burial, the body is left out on a mountaintop for the elements to decay. Birds, animals and other scavengers find meals in the corpse, and the rest of the remains are wiped away by weather and natural decomposition. This procedure sometimes involves ceremony. Monks sometimes will perform chanting and ritualized burning of incense where the body is to be left. Then, the body is broken apart by monks. Eyewitness accounts have noted that the body-breakers (rogyapas) do this task with no somber demeanor, chatting and laughing while they work. Once deconstructed, the body is then left for vultures and other carrion birds to feast upon, usually on a flat, rocky surface. There is a matter-of-factness about this kind of burial, from the concept of allowing a body to naturally decay, to the thought of presiding monks joking with each other as they cut apart a human body. However, these funerals are ancient traditions, and are steeped in spiritual meaning for those in attendance. What about the family of the deceased? Sky burial is part of the death culture in parts of Mongolia, Tibet, India, Sichuan and Qinghai. Loved ones of the deceased person can attend the sky burial, sometimes standing out of sight of the procedure. Sky burials are not free, or even affordable, for many families. Families will pay large amounts to have presiding monks, ceremony and dismemberment of their beloved relative's remains. For those who cannot afford these rituals, the body is simply left upon a flat mountainous rock for nature to decompose. For many western mourners, this type of burial goes against everything western funeral practices reinforce. Sky burials offer a corpse no protection from the elements or decay. There is no restoration of the body to a lifelike form (such as in the process of embalming); in fact, the body will be torn apart in order to make the organs and tissues more accessible to hungry scavengers. Sky burials are technically the most environmentally friendly way to handle a dead body, because the remains of a beloved person go back to the earth in a natural cycle of life. Sky burials can be likened to organ donation in some ways. Organ donation means body parts are harvested at the end of a person's life in order to improve or save the lives of people who are ailing. The gift of organ donation is truly a selfless one, and not a decision many people make lightly. However, there are over 100 million registered organ donors in the United States alone, so it is clear that many people push aside their discomfort with death in order to benefit the greater good. It is these same premises that make sky burials understandable to those who may feel uncomfortable with corpses. A sky burial is a donation of a body back to the earth. This practice creates life from death, and allows wildlife to grow and thrive through the loss of a person. Buddhism teaches that life is not permanent. The belief that all life is created through the process of reincarnation drives the ideology behind the practice of sky burials. The idea of sky burials is particularly attractive to those who consider themselves to be death positive. Death positivity is a harm reduction approach to all ideas surrounding death. Death positives believe in communicating openly about death because it is inevitable for all. Frankness about death means people receive better and more comfortable end-of-life care, mourners are given the opportunity to grieve in healthier ways, and funeral practices can be more environmentally conscious. Caitlin Doughty, founder of The Order of the Good Death and leading death positivity advocate, famously taught people about death and bodies in her YouTube series, Ask a Mortician. She presented a TED talk on the subject of sky burials in 2017, in which she expressed the ancient practice to be her own personal burial preference. Sky burials represent the return of organic matter to the earth, and the furthering of life cycles beyond human benefit. Though the practice of sky burial is unlikely to become mainstream in North America, it is fascinating to learn about how deaths are handled in other parts of the world. The intent and impact of these funerals have much to teach about the way we consider our values, the environment and the natural cycles of life and death.